The Dow Chemical Company is a $60 billion enterprise composed of a worldwide network of 13 business units. Although such a decentralized business structure has competitive advantages, it can also create challenges to setting and achieving enterprise-wide goals. For instance, Dow needed to meet the differing facility needs of its various businesses while also increasing office and lab space capacity use to 90 percent and improving capital planning, real estate lease management, operations, maintenance and energy consumption on a global basis. 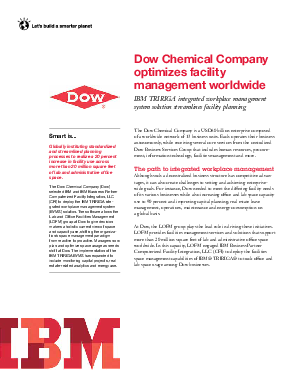 The Dow Chemical Company selected IBM and IBM Business Partner Computerized Facility Integration, LLC (CFI) to deploy the IBM TRIRIGA integrated workplace management system (IWMS) solution. The software allows the Lab and Office Facilities Management group at Dow to give decision makers a holistic current view of space and capacity use, shifting the organization’s space management paradigm from reactive to proactive. This case study examines how the Dow Chemical Company managed to ultimately set and meet its enterprise-wide goals.